This demonstration of a warm sunset watercolor painting was first done as a class exercise with my students. It received some very favorable comments so I have decided to do a full step by step watercolor demo of it. I chose this sunset image, which is full of warm colors and interesting reflections, because I have always been attracted to scenes with mood and atmosphere. 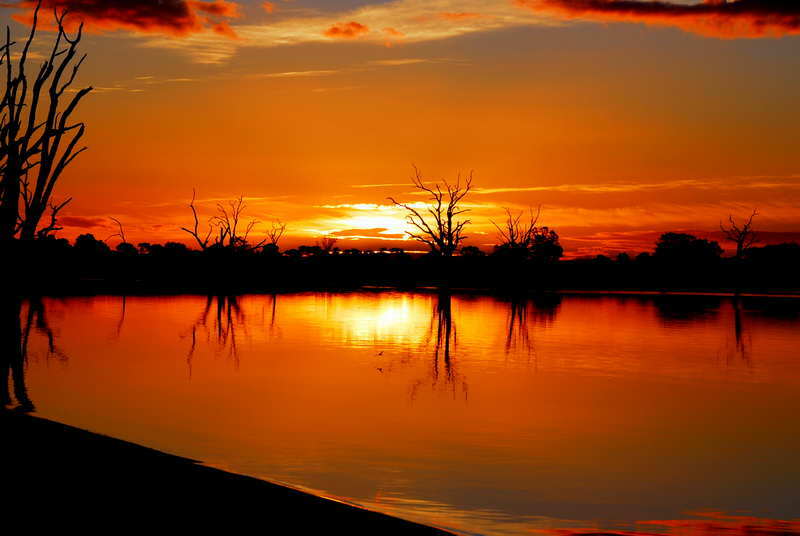 The reference photo below was provided by my friend Robyn Lovelock and is of Lake Bonney in South Australia, close to the borders of Victoria and New South Wales. The location is renowned for its beautiful sunsets. This photo (figure 1) required very little editing to turn it into a nice watercolor painting and had the added benefit that I could show my students how to tackle soft water reflections in barely damp paper. If not done at just the right time you can end up with unwanted back runs or cauliflowers or edges that are too indistinct. On the other hand if you wait too long you can end up with hard edges which would not look as good for this watery scene. Notice how the silhouette of the trees against the warm sky is quite sharp whereas the reflections have a soft look to them. You should also see that the distant shore forms a light line in parts. I will attempt to capture these effects in my painting. The only prior drawing required was of a horizontal line representing the distant shoreline. The rest of the painting does not need any drawing as the shapes are relatively simple and the location of the trees and their shapes can be decided upon after the sky is complete. In this way if a problem develops in the sky wash it may be possible to cover it by a tree! More importantly depending on how your watercolor sky finishes up the positioning of the tree line can be such so as to take full advantage of your final sky design. I placed the distant shoreline lower than in the photo to keep it well away from the center of the work. I didn’t want the shoreline to divide the painting in half. When I paint a scene like this I never slavishly try to paint everything that is in the photo – if I wanted to do that then I would just frame the photo. As artists we have the ability to extract the essence of an image and hopefully improve on it. Watercolor paints: Winsor and Newton artists quality water colors, French Ultramarine, Cobalt Blue, Burnt Sienna, Cad Yellow Pale, Cad Orange, Permanent Alizarin Crimson. Other equipment: Water spray bottle which produces a very fine soft mist. Masking tape – 1″ wide to fix your watercolor paper to your board. Simple watercolor easel to hold your watercolor paper at about a 20-30 degree angle. If you don’t have an easel then just prop you board on something about the height of a tissue box. We are now ready to start our painting. We will first tackle the warm sky.